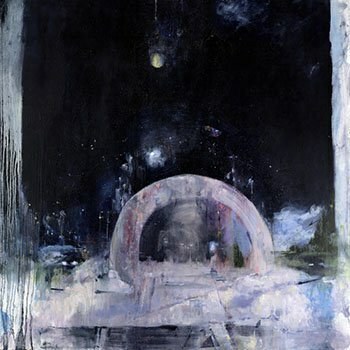 Daughter's Not to Disappear beautifully distills what it means to be human and to experience pain, but with far greater nuance and maturity than their debut. Although almost three years separate Daughter’s If You Leave and its follow-up, Not to Disappear, the London-based trio haven’t shaken off the deep melancholy that characterized their debut. If You Leave was a catalogue of bitter heartache. Through smoky plumes of reverb, singer Elena Tonra obscured her embitterment with pensive lyrical twists and turns, and with whips of trebly guitar and swathes of corroding drums, Igor Haefeli and Remi Aguilella shaded wintry soundscapes. The result was a stunning display of human vulnerability and musical solemnity, which earned the group wide critical praise. Buoyed by the emotional heft found on If You Leave, Not to Disappear might be considered a sequel. But with two years of heavy touring and with the refined hand of producer Nicolas Vernhes (Animal Collective, Deerhunter, the War on Drugs) comes greater boldness, ensuring their sophomore album to be much more than a reiteration of their first. Although Tonra remains mired in the effects of loss, loathing, and loneliness, she develops a new and unashamed lyrical candor that is all the more staggering. Mothers, lovers, and even dogs populate Tonra’s lyrics on Not to Disappear, but she remains the album’s most moving subject. Whether in her claims for personal independence in “To Belong”, or in her wavering pleas for intimate connection in “Fossa”, Tonra emerges from a quagmire of pained selfhood to address an absent, unnamed “you". The act of direct address molds Tonra’s sense of individuality and intimacy (or sometimes lack thereof). In addition to Tonra’s lyrical candidness, Haefeli and Aguilella come more clearly into the foreground, not merely coloring the songs with bleak atmospherics, but instead voicing their own disconsolation. There are the shoegaze drones and post-rock glints of “New Ways” and “How”, as well as the animated guitar-lines and rippling drums of “Fossa". Each instrument forges an intimate connection with Tonra. For example, using fuzzed-out electric guitar squalls and propulsive drums at the end of “New Ways”, Haefeli and Aguilella shape an immense crescendo for Tonra to wrap her lines around, as if the music has replaced the lover that has left her. That said, the band demonstrates a tendency toward the formulaic. For example, in “Numbers”, Haefeli’s spare guitar-smithing contorts through a synthetic fabric and is worked into shape by Aguilella’s percussive strokes. The song builds to an apocalyptic climax marked by Tonra’s repeated line, “I feel numb in this kingdom”, before falling to a diminished denouement that is less cathartic than reflective of the song’s residual torment. Much of the album follows this structure. But by no means is this a criticism. In fact, there is something remarkable in feeling the way each song’s chillingly labored build contains its own impending deconstruction, as such sonic structures parallel the conflicted emotional logic of the album. Altogether, the record beautifully distills what it means to be human and to experience pain, but with far greater nuance and maturity than their debut. From the album’s onset, Tonra sings of “new ways” of trying “not to disappear". With this release, it’s clear that Daughter will not disappear any time soon.